The MCE Magnetic Stand combines a strong magnetic core to achieve fast and efficient separation. 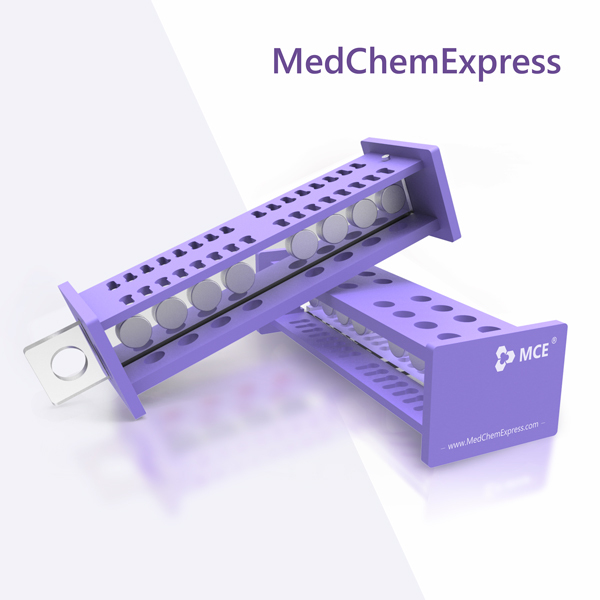 Featured with a unique sandwich groove design, MCE Magnetic Stand can hold up to 16 standard 1.5-2 mL EP tubes and facilitate user’s single-hand operation. The smart ergonomic design provides a good control and visibility of your sample. The top rack is easy to fasten and remove for experiments. This product is suitable for antibody purification, immunoprecipitation, co-immunoprecipitation, cell sorting and nucleic acid separation. MCE Magnetic Stand (200 μL/2 mL/15 mL) is suitable for magnetic separation experiments, which use standard 200 μL PCR tube, 1.5 mL EP tube, 2 mL EP tube and 15 mL centrifuge tube. 1. Depending on the experimental parameters and sample volume, the magnets’ sites are adjustable and the suitable magnetic stand may be different. 2. In order to reduce the loss of magnetic beads, please put the bottom of sample tube (centrifuge tube or EP tube) close to the groove at the bottom of the magnetic stand. This promotes bead adsorption on the side wall of container, therefore after the beads are gathered into a point or a line, slowly and carefully pour out the liquid or gently remove the supernatant with a pipette. 3. As the magnetic stand has a powerful magnetic field, please be sure to avoid contact with cell phones, computers, watches, pacemakers, magnets and other objects susceptible to magnetic interference. Be cautious of knives which may incur people injuries. 4. If multiple magnetic stands (≥2) are needed at the same time, they should be placed separately to avoid mutual influence of magnetic fields. Do not put a number of magnetic bars together in order to prevent clip injuries. 5. As the magnetic stand has a plastic shell, avoid direct contact with corrosion substances, such as strong acid and alkali. 6. Please do not disassemble the Magnetic Stand as there is a powerful magnet core inside. 7. To protect the Magnetic Stand shell, avoid long-time exposure to sunlight or ultraviolet radiation. 8. To keep the magnetism of the Magnetic Stand, avoid exposure to heat or a strong external magnetic field environment. 9. Please clean the magnetic stand, keep it dry and store properly after use.